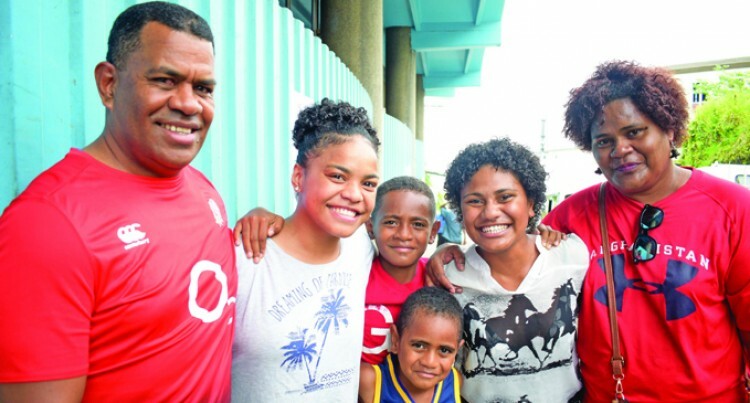 Dudley High School year 12 students and friends Grace Tuimua (second from left) and Asinate Koroi (fifth from left) with their family members after collecting their year 12 results from Ministry of Education result centre on December 19, 2018. Photo: Ronald Kumar. Asinate Koroi took a step closer to her dream to be a lawyer after scoring 360 out of 400 in her Fiji School Leaving Certificate (FSLC) Examination. The FSLC provisional results were released yesterday. The 17-year-old hugged her mother as soon as she saw her results and jumped with joy. She hails from Levukaigau Village in Gau and has maternal links to Nukuloa Village in Gau. She is the second eldest of five siblings. Asinate attended Dudley High School. “The marks I got were higher than what I expected and I am so happy. Getting these marks means I can finally study business law,” Asinate said. Asinate dedicated her achievement to her teachers, parents and friends who never gave up on her. “No one in my family is a lawyer and I want to be the first. We have a lot of doctors in the family and I want to do something different,” she said. “I sacrificed social media and spending time with my friends so that I can study hard and reach my target and it was worth it. Her mother, Taina Koroi, said she was happy with her daughter’s achievement and would stand by her daughter in whatever career she chose.